I closed up my office late Monday afternoon, with the rest of the week free and two weeks worth of loooong days at work behind me. The laundry, the garden, the house, the dog, the boyfriend... all had been relatively neglected during our big summer event, and all needed some attention. On Tuesday, I slept in, had a nice breakfast, took the dog for a very long walk, and then got out into the garden to enjoy all of the beautiful sunshine. First destination: The back yard, where some veggies are still in need of planting out and the weeds have been allowed to run rampant. 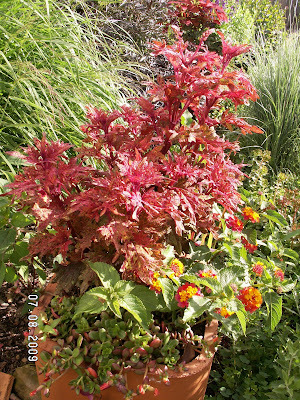 'Desert Sunset' lantana, a portulaca that was supposed to be 'Yubi Red' but isn't--the flower petals are "broken" in red and gold instead of being all red--and a coleus whose tag I will have to find to give you a proper ID. 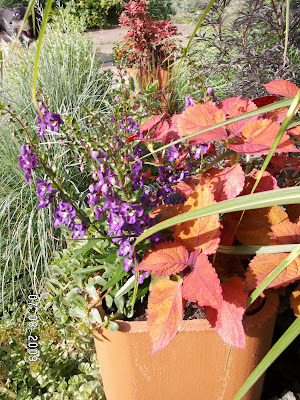 'Sedona' coleus, 'Yubi Red' portulaca, and 'Angelface Blue' angelonia. Coco likes this corner of the garden, for a few reasons: 1) It's usually cool there. 2) The neighbors on this side have a chocolate lab named "Hugs" (whose siblings are named "Kisses," "Hershey," etc.!) who likes to meet her for a sniff here. 3) There's a knothole in the front panel that gives her a great view of what's going on in the street. 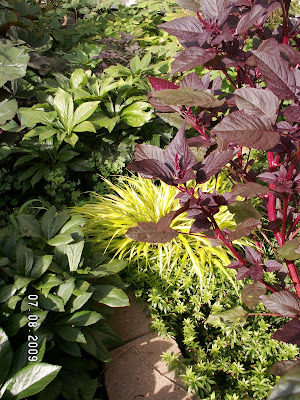 'All Gold' hakonechloa, 'Hopi Red Dye' amaranth, hellebores, sweet woodruff, goatsbeard, and 'Hillside Black Beauty' cimicifuga/actaea. This is one of those compositions that probably "shouldn't" work, but really does--for me, at least! 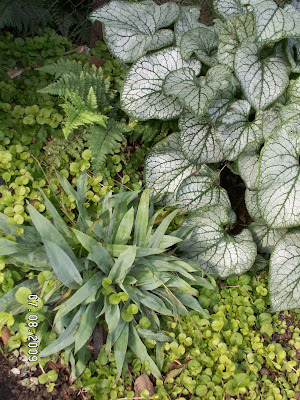 'Jack Frost' brunnera, carex platyphylla, and Scaly Buckler Fern surrounded by golden creeping jenny. What a lightweight!!! LOL. 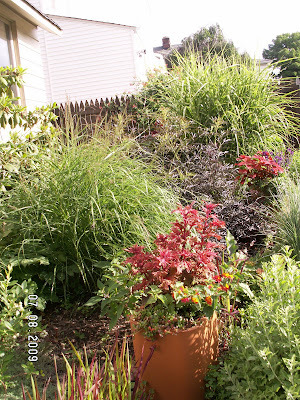 We have two more gorgeous days of sunshine and great gardening weather ahead of us--and probably a mulch delivery, too--so there's still lots of work to be done. Time to get out there, and get busy... I hope that everyone else is enjoying the wonderful gardening weather that I'm getting this week! Your garden doesn't look a bit out of shape for its neglect. It is quite lovely. Enjoy your time off. 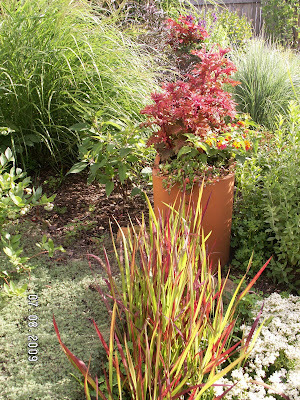 Your designs are spectacular as ever, even without the Canna foliage. 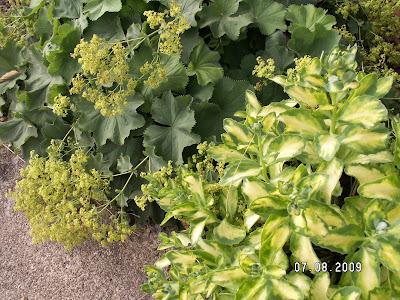 I'm so relieved to see that you've also got chartreuse foliage near your Brunnera 'Jack Frost.' I accidentally plunked some next to mine. It's great that Coco has found a place she can hang out that doesn't do any damage. (I love the name "Coco's Corner.) At my former house, my Borzoi used to like to lay on the north side of the house - on top of the Hostas. They always looked terrible. Take it easy on that pup - it's hard to be furry & black in summer. I hope you have a wonderful time off, Kim, and your gardens look fabulous as always. Now, if you see the sun anywhere, please send him up here, okay? He seems to have forgotten us. 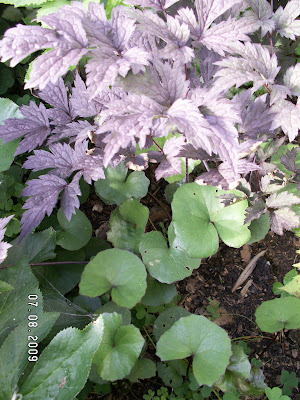 I notice you have a black lace elderberry too. I've just added one to my front walk this spring. No flowers yet, but a few green shoots of new growth. 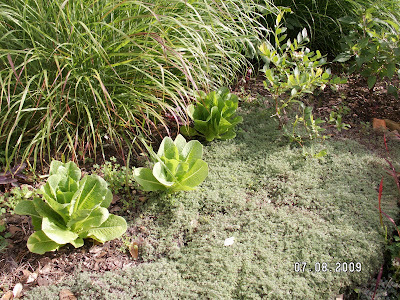 The Jack Frost brunnera is on my list, I just have to find a spot for it. Loved this loooooooong walk through your garden Kim. Isn't it wonderful that our gardens are never the same even if we did the same thing every year to it (and who would want to do that, not me) they are -always- different. OT I never have problems picking gooseberries, I just pick them carefully with one hand while the other keeps the branch from moving. Works a treat and I hardly have any scratches. Thanks, Greenbow Lisa! But I purposely avoided taking photos of the really bad spots... ugh. lol. Rhonda, that's soooo true. Having time to putter and work in the garden IS such a luxury, and a labor of love! Thanks for stopping by and commenting. Mr. McGregor's Daughter, thank you. 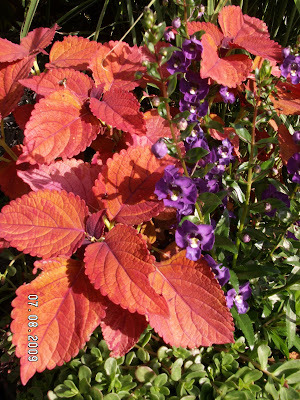 I actually had planned to pull the golden creeping jenny when it got too close to the silvery 'Jack Frost,' but when I missed it and saw how pretty the combo was, I decided to keep it. 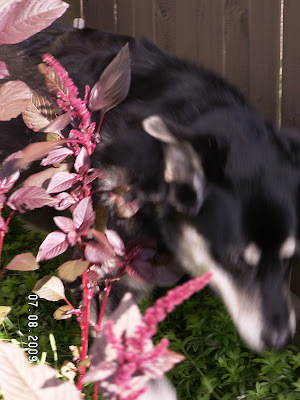 And I'm LOL about your Borzoi and the hostas! Coco likes to sprawl out on either the mat of dianthus in the back, or the patch of sedum in the front... with similar effect. 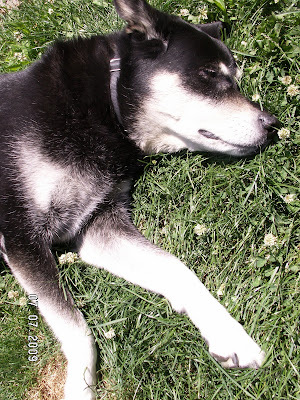 :) And it's definitely tough to be black & furry in summer--that's why I was so surprised that she was laying in the sunshine. Usually she's back on the cool, shady cement when it's sunny. Jodi, really?! It's been so sunny here that we're hoping for some rain soon. *sigh* Want to trade me weather? Please?! Cheryl, I was surprised at how big this elder got this year... 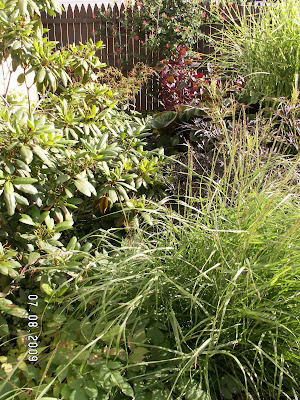 I think that next year I'm going to do a better job of cutting it back in the spring. I even have berries on mine, this year--but then again, I also have another elder to pollinate it. Yolanda Elizabet, thank you for the info on the gooseberries! Every time I look at those intimidating thorns, I end up flat-out giving up on the thought of buying one... lol. Kim, I'm glad to hear you're having some time off from your busy work schedule. Isn't it a luxury to have time to walk with your furry garden assistant, and then potter in the garden (after the picture taking, of course!)? I wish we had some of your lovely sunshine, and less of our chilly, rainy days. We enjoyed a tiny taste of summer sun the last couple of days, but today was overcast again with thunderstorms and showers. It's every other day, it seems...or more! Your color and texture combos are so beautifully put together. 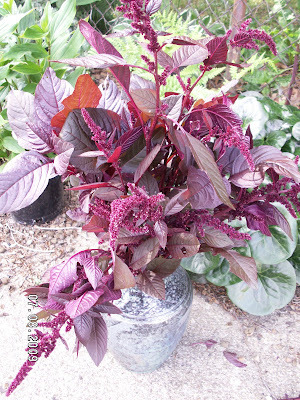 I love that 'Black Lace' elderberry, and your tile planters are cheerful and bright spots of color. I'm sorry to have to tell you that my Russian Sage and Baptisia didn't winter over, along with a caryopteris passed along by my DIL. You can imagine my disappointment. However, I do have Cerinthe Major seedlings, so all is not lost! Hello Kim. Your garden is an absolute delight! I love strolling through it with you. 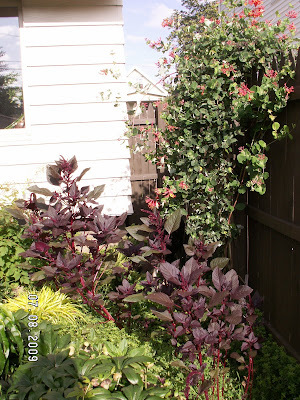 I have a blog too about my gardens. Everything is new this year as we just moved to this house and I had to start literally from scratch. So it's especially lovely to wander through your so very well established garden. I read back through a few recent posts too. What camera did you decide on? I have a Nikon D-80 which I both like and curse with regularity. Thank you for sharing. Maybe since we're so close to each other, my plants will take the hint and start growing faster. All of them were planted this spring so I have to allow them some leeway. Kerri, it definitely is a luxury--sorry to hear that you've had chilly, rainy days there. 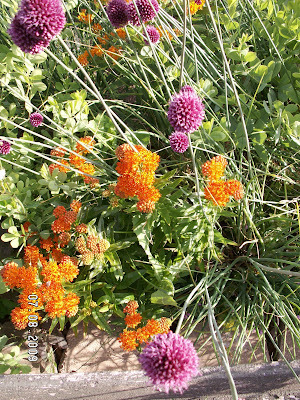 That really takes some of the fun out of even the most colorful of gardens, like yours. 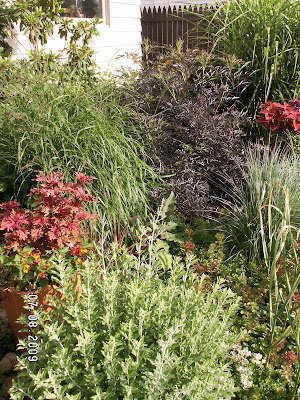 Sorry to hear that the Russian sage and baptisia didn't overwinter--want to try it again next year? Muum, thank you! I think that my Garden Assistant needs to get a little more productive... all she eats is tomatoes, peas and raspberries, currently. lol. I'd ask to borrow a cat, but it sounds like you need them there! I didn't actually buy a camera yet, but I have a Nikon similar to yours at work. I alternately love and curse it, too... honestly, I HATE that the camera is soooo much smarter than the person taking pictures with it! I need to learn. 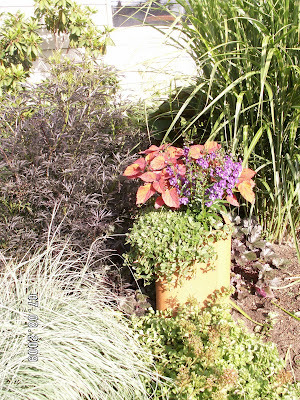 I think your tile planters are wonderful, especially that coleus. My dog helps me exactly the same way! Sometimes I wonder what she thinks I am doing when I am weeding. . . Dogs just crack me up.